When creating a masquerade ball our key is in the draping, lighting and the props! Setting the right tone for the event is essential, purples, whites and yellows really do create a beautiful impact for this theme. Here are few pictures from one of our previous events! Our top pick for a Masquerade Themed Ball and one we used for this particular event is a cirque show. This performance was the real wow factor to the event and left guests speechless throughout the entire show! Here is some live footage from the event! 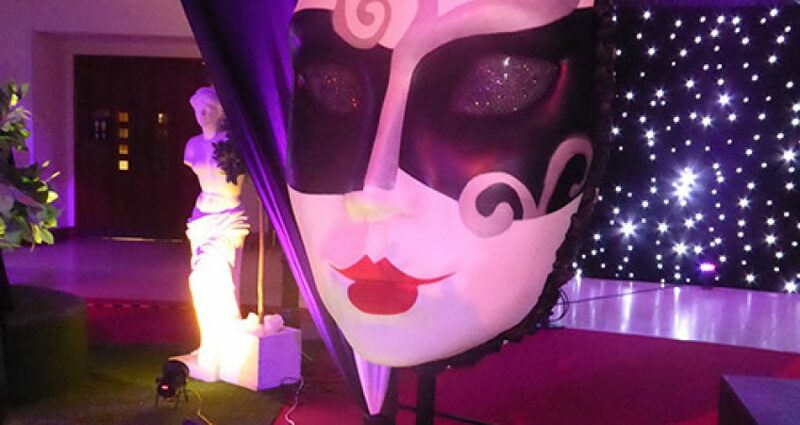 For more information on our Masquerade Themed Ball please contact one of the team today! I was wondering what your price range was. I’m looking to arrange a corporate Christmas Party for around 200 people. We are based in Manchester and would possibly be interested in your Masquerade Themes ball but we are on a tight budget. Could you let us know what sort of prices there is? We don’t need a lot included as long as we have decoration, music and a photo booth.